Storey and students at one of the short beauty courses provided by London College of Fashion in the Za’atari Camp. Picture: LCF. The third incarnation of Dress for Our Time could be its most powerful yet: working directly with the people of the Za’atari refugee camp. In 2015, social artist Professor Helen Storey launched an extraordinary campaign: using the various vehicles of fashion and design, passion and politics, Dress For Our Time was a document highlighting the plight of a planet in thrall to climactic changes (read more here). By 2016, the project had evolved. The Dress, made from a decommissioned UN refugee tent, became the canvas for a tragic set of figures: UNHCR data showing the number and location of displaced people around the globe, in which lights, each representing one hundred human lives on the move, were projected onto the dress itself. It was not a map of the world but a map of people fleeing for life and where they eventually arrived at. 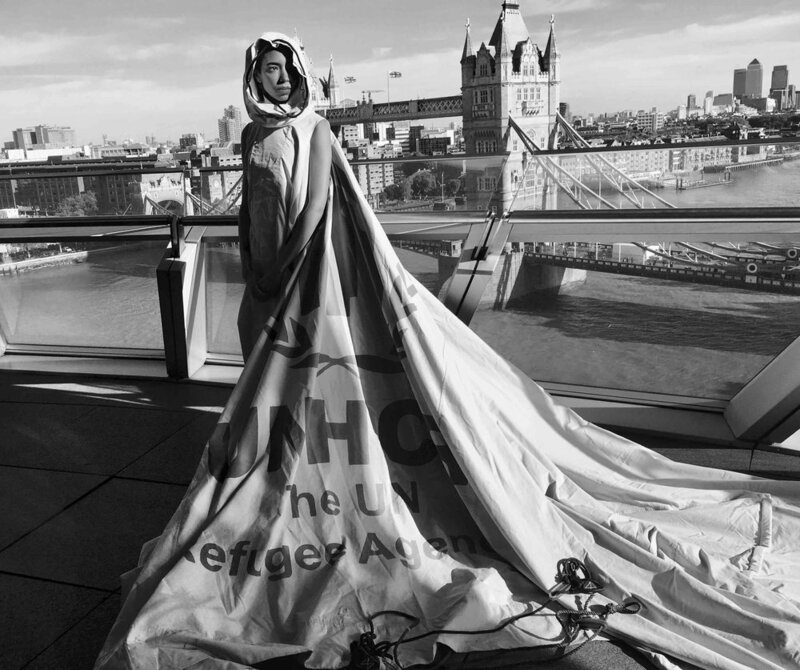 From its exhibition at the Science Museum to its place on the Pyramid stage at the opening of Glastonbury 2016 to its stately progress through City Hall for the inaugural London Peace Talks, the dress is variously a reflection, a call-to-action and a reminder of the human side of the refugee crisis and of the importance of all human life. Dress For Our Time at The London Peace Talks. Picture: Helen Storey. First opened in 2012 to host Syrians fleeing from civil war, Za’atari covers over 5.2 square kilometres, providing shelter to some 85,000 people, 78 per cent of whom are women and children. Already Jordan’s fourth largest city, it shows all the signs of becoming permanent. The initial single zone has multiplied into 12 separate districts. There are 3,500 pop up shops, gathered, in part, along a street called the Champs Elysee. Every night, 35,000 loaves of bread are baked in Za’atari; every week, 20 weddings take place. For Storey, developing projects for the camp’s inhabitants has been intuitive and organic. “Initially, [it was] very deep listening, no matter what it is you’re hearing, trying to understand what their hopes and wishes are for the future – and then creating work or projects out of that, tackling real life problems on the ground. So, reporting back all the potential to Frances Corner, Head of London College of Fashion, a series of accredited University short beauty courses were delivered on the next trip to the camp. Meet a (future) engineer, lawyer, doctor and maths teacher: the TIGER girls at Za’atari Camp. Picture: Helen Storey. In another project, #LoveCoats, Storey works with a team of young girls aged between 8 and 16 who call themselves the Tiger Girls, short for Inspiring Girls Who Enjoy Reading, an acronym the girls came up with themselves. To answer those themes, Storey and her team collaborated with NRS, a global supplier of humanitarian equipment, who’d donated a thousand metres of thermal blankets. Together with the rest of Oxfam’s onsite textile mountain, the team are working with the girls to create coats, inspired by their own identity, which at night can double as blankets. Everything left over can be crafted into gifts for friends and family. The #LoveCoats project will be delivered to the girls early July, during the team’s fifth trip to the camp. On discovering a bank of surplus bicycles, for example, Storey’s Sheffield university collaborator, Tony Ryan, suggested projects in which the bikes could be turned into transport for women and children; virtually by the time the team had returned to the UK, the young men in the camp had set up what could perhaps be best described as the Zaat’ari Uber service.